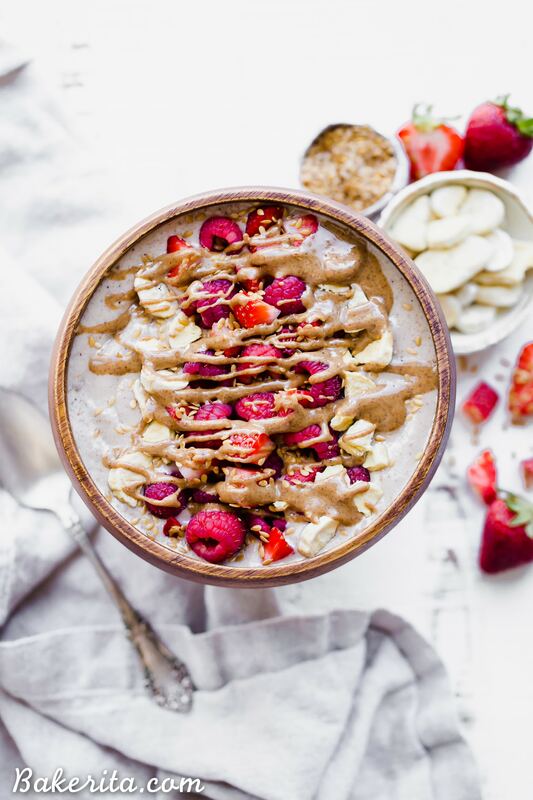 This Banana Date Smoothie Bowl (or smoothie) is a creamy and sweet treat that tastes like ice cream but is simple and healthy enough for breakfast thanks to a secret veggie that’s snuck in there. Make yourself a bowl of this paleo and vegan banana date goodness on the next warm morning for a refreshing breakfast. Sooo…I put cauliflower in your smoothie. Don’t knock it until you try it, guys! Because this veggie-filled smoothie does NOT taste like it’s packing veggies – I promise. In fact, it tastes more like a sweet banana milkshake, which I am ALL ABOUT. 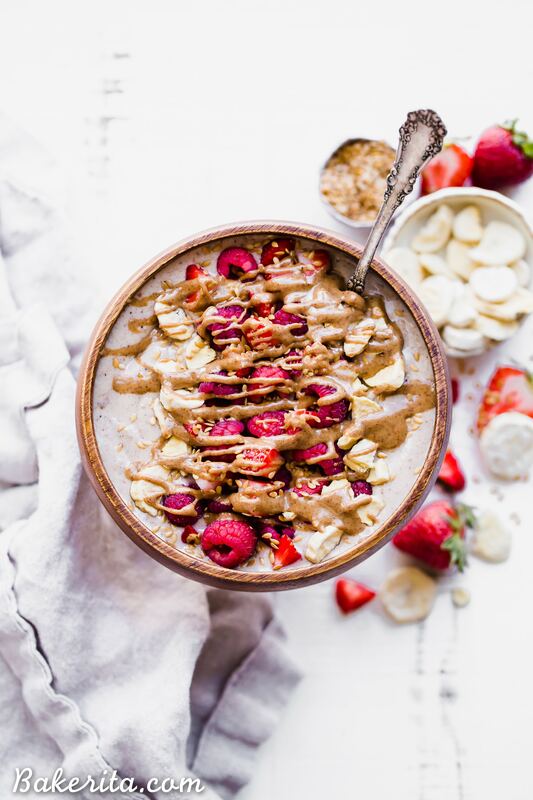 This sweet & simple smoothie bowl was inspired by a local favorite. In San Diego, we’ve got this healthy grocery store, Jimbo’s – they have pretty much all organic everything and have been doing healthy since before it was “cool”. I LOVE Jimbo’s and get legitimately sad that I don’t have one all that close to me where I live right now so I always swing by when I’m coming back from north county San Diego. One of the best things about Jimbo’s is there hot prepared foods section (when I was eating gluten and dairy, their mac and cheese was LIFE) and their smoothie bar. My dad recently requested/suggested a recreation of the Palm Dessert Smoothie, and I of course immediately knew I had to replace that ice cream with something a little more breakfast friendly. Enter: CAULIFLOWER. The cauliflower blends into the bananas and becomes smooth and creamy – you won’t even notice it’s there! Just make sure you steam it before freezing or buy it pre-steamed (I think Whole Foods brand is already steamed) – steaming gets rid of any weird raw cauliflower taste. The banana and cauliflower are paired with a date for a little extra sweetness, a scoop of almond butter and a spoonful of flax seeds for some extra fat + protein, and then you can optionally add a splash of vanilla extract and/or a shake (or two) of cinnamon. So good! 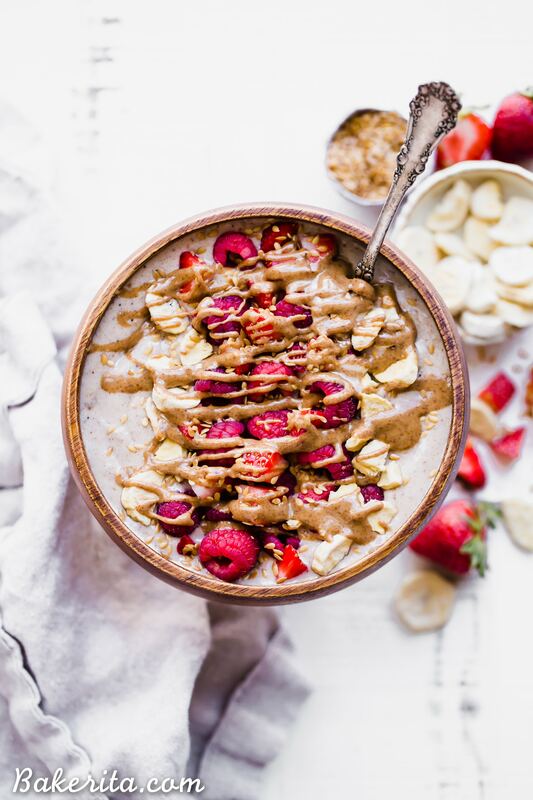 This Banana Date Smoothie Bowl (or smoothie) is a creamy and sweet treat that tastes like ice cream but is simple and healthy enough for breakfast thanks to a secret veggie that's snuck in there. Make yourself a bowl of this paleo and vegan banana date goodness on the next warm morning for a refreshing breakfast. Combine all of the ingredients in a blender (I used my Vitamix). 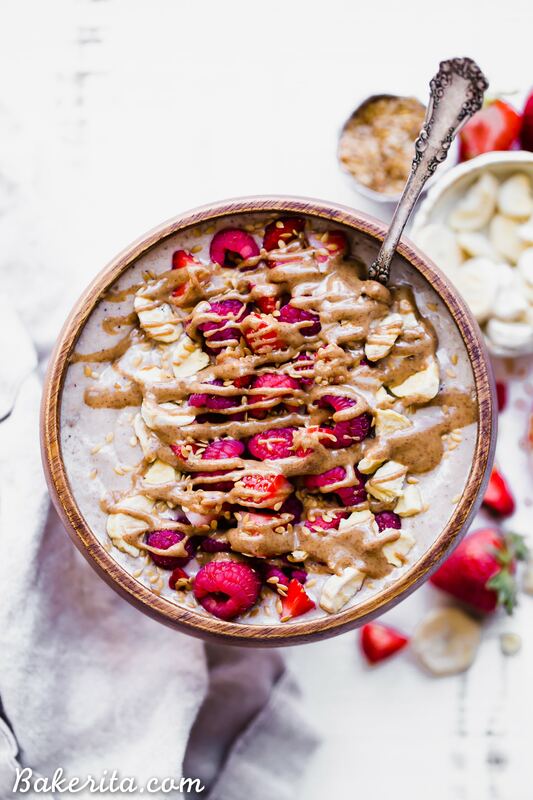 Blend until smooth + garnish with freeze-dried bananas, flax seeds, almond butter, berries of choice, and/or whatever other goodness you feel like! Nutrition facts do NOT include toppings! This sounds so delicious! I love banana and have never put it into my smoothies for some reason. Definitely going to try this out! Wow, then you’ve definitely got to try it! Thanks for the love Jack.